Crofton Lock No 60 Winding Hole is a minor waterways place minor waterways place place on the waterways major waterways place village town city on the Kennet and Avon Canal (Main Line) between Newbury Bridge No 60 (15 miles and 6 furlongs and 25 locks to the east) and Pewsey Wharf (Pump out available here (BW card)) (7 miles and 1½ furlongs and 10 locks to the west). 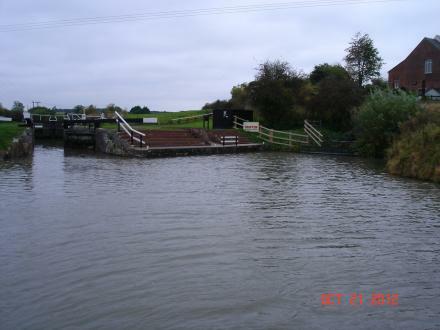 The nearest place in the direction of Newbury Bridge No 60 is Crofton Lock No 61; 1¼ furlongs away. The nearest place in the direction of Pewsey Wharf is Crofton Lock No 60 (Crofton Pumping Station); ¼ furlongs away. Water tap is immediately above the Lock. Only 60' boats or less can turn here. Grafton Road, Marlborough, SN8 3SS — 1049 yards to the southeast. Severalls, East Grafton, Marlborough, SN8 3DL — 1579 yards to the south. Seymour Grafton Rd, Burbage, Wiltshire, SN8 3BA — 1147 yards to the south. 13 Severalls, Marlborough, SN8 3DL — 1617 yards to the south. Marlborough — 1082 yards to the southeast. Crofton, nr Great Bedwyn, Marlborough — 430 yards to the northeast. Marlborough — 83 yards to the southwest. 4 Upper Brooklands . Wilton Marlborogh Wiltshire., Wilton, SN83ST — 1014 yards to the southeast. 214 Hollow Lane, Wilton, SN8 3SR — 1277 yards to the southeast. Marlborough, SN8 3 — 1610 yards to the southeast. Marlborough — 997 yards to the southeast. Crofton — 1271 yards to the northeast. Marlborough — 1002 yards to the southeast. 160 Crofton, Marlborough, SN83DW — 954 yards to the northeast. Marlborough — 112 yards to the west. 163 Crofton Road,Great Bedwyn, Marlborough, SN8 3LX — 1225 yards to the northeast. Brass Castle Lane, Teesside County Borough, TS89EE — 1082 yards to the southeast. Crofton Beam Engines, Marlborough, SN8 3DN — 430 yards to the northeast. 98 yards to the west.